Never Enough Nails: Preview of the New Zoya Collections! Reva (ZP546) - A cool toned strawberry red with glowing golden metallic sparkle. A very rich and luxurious looking gilded red. Kimmy (ZP547) - Gleaming metallic candy apple red brightened by gold sparkle. Not your usual red shimmer- this one has a fiery attitude. Apple (ZP548) - Luminous yellow-toned apple green packed with gold metallic sparkle. A dimensional green that's clean and bright. Tanzy (ZP549) - Light, bright tangerine orange with yellow gold metallic sparkle. A sunny orange that's easy to wear year-round. Rica (ZP550) - Warm light coral with pink and orange tones and heavy gold metallic sparkle. An alternative to flat corals for when you want to shine. Faye (ZP551) - A bronzed mauve with purple and brown undertones flooded with right gold sparkle. A unique gilded shade that will work in any season. Sooki (ZP552) - Bright, clean, crisp cool cherry red cream with a subtle jelly finish. For an irresistible, attention-grabbing red nail. Areej (ZP554) - Pink with an opaque cream finish. A pink for when you want a bold pop of color but not something neon-bright. Kieko (ZP555) - Warm, red toned dusty light purple with berry tones with an opaque cream finish. A nice alternative to pure pink or berry, especially flattering on warm skin tones. Mira (ZP556) - Blue toned medium purple with dusty lavender tones and an opaque cream finish. For a muted yet colorful purple that isn't too dark. Breezi (ZP557) - Soft, dusty, medium cerulean blue with an opaque cream finish. A super chic high-fashion denim look for nails. The Sunshine and Summertime collections are available now at Zoya.com. Faye looks like it will be my favorite of the collection! 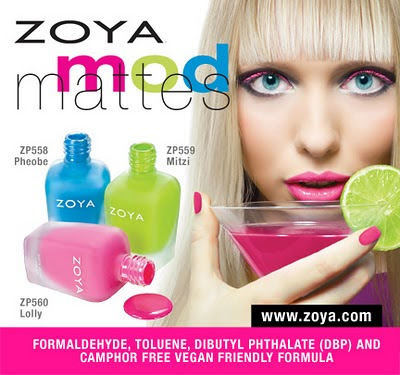 Zoya also has the modmattes collection out today. I am definitely looking forward to all three of these. I love mattes for those days when you have no time for basecoat, three coats of lacquer and top coat! It's funny though, usually Zoya sends their collections out to bloggers and we see swatches before the collection is actually available, but I haven't really seen swatches. I saw some quick ones on a nail wheel, but that's it. I want Faye and the three mattes, just based on pictures.